It's that time of year again. John D. Reid of Canada's Anglo-Celtic Connections blog is holding his 5th annual Rockstar Genealogist(s) contest. This has become a much anticipated event in the genealogy community. 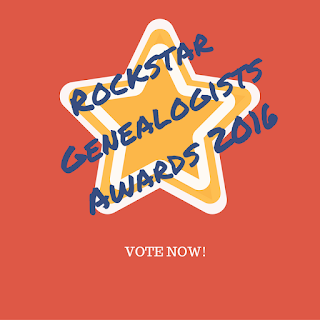 What is a Rockstar Genealogist? According to John "Rockstar genealogists are those who give "must attend" presentations at family history conferences or as webinars, who when you see a new family history article or publication by that person, makes it a must buy. If you hang on their every word on a blog, podcast or newsgroup, or follow avidly on Facebook or Twitter they are likely Rockstar candidates." Here is your opportunity to vote for your favourite genealogists. You can vote for more than person. You can vote for genealogists in other countries. The important thing is to vote! I'm excited to be one of many genealogists nominated this year. If you follow me on Twitter, and/or Facebook, if you have attended my webinars and/or presentations, if you have read my latest article in Family Tree Magazine, then I hope you'll cast a vote for me. Vote for Kathryn Lake Hogan!